Class has begun, notebooks are out and pens are uncapped, when without warning, the fire alarm begins to shriek. There is an audible groan as students slowly file out of classrooms knowing they are losing at least 20 minutes of precious class time. The thought of ignoring the wailing siren crosses their minds as they unwillingly pack their bags. Students roll their eyes and begin walking towards the football field as the fire trucks pull up. While many are acutely aware of their own inconvenience, how often do they consider the consequences that these alarms have outside of the Paly campus? What happens when a false alarm rings five minutes before a real emergency, and there is only one station available? NP: So, they will tell us, ‘You need to reset the alarm’, so we go, we put a key in, (because you have to have a certain key, the school can’t do it) and we set the panel. But the big consequence of pulling the fire alarm, like you asked, is that we have six engines in Palo Alto (firefighters and paramedics on board) and we run close to maybe 8,000 calls a year. We have two transport ambulances [and] another ambulance that takes an engine coming out of service. 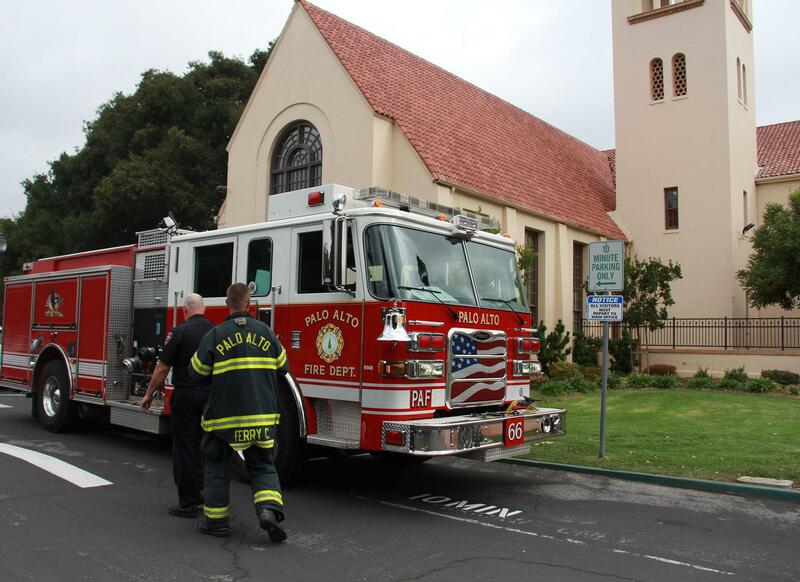 So it’s very common that Engine 6 or Engine 1 or Engine 3, that the one that responds to Palo Alto High School at that time, is the only in-service fire engine at that time. So what will happen is, if somebody calls 911 because their son is choking, or their house is on fire, or their dad is having a heart attack, we can’t just leave Paly High because we think that it’s a false alarm. Legally we have to see it through. So, it could be a five, 10, 15, minute gap between that call, who gets that service on the wrong day. So it is a big deal because it could be one of their families that live close by. JS: But not only that, every time we respond to an emergency we put our lives in danger, we put the citizens lives in danger — because we are driving a $40,000, 4,000 pound fire engine. Hard to stop. You know you could kill somebody, you could hurt somebody, so if we are going Code 3, it’s very dangerous. So for a false alarm, you are putting a lot of lives in danger. Kids that are playing with the alarms — they don’t know the consequences. NP: Sure, and I would have done that when I was in high school. I mean you just don’t get it, you just don’t understand the major consequences. JS: And I guess we haven’t done a great job teaching the community. I used to go to my ex girlfriends’, she was a kindergarten teacher, and I used to go talk to the kids about 911, and the response, and what it entitles you to. How do we respond? We need to educate them young, that pulling the alarm is just not fun and games. I don’t know what the liabilities are about if we go into a fire alarm and it was false, and there was an accident where someone got hurt, if it could be traced back to the person that did that. V: If you could tell the students at Paly one thing about the fire alarms, what would you say? NP: I guess that it just has more consequences than they understand. That it could be their own family member that’s driving in the city that gets hit by the fire engine, or that calls 911, or their sibling that’s at home is choking. It’s just a bigger deal than they realize, and that maybe just to be educated about that. MG: And to pull to the right when you hear sirens. JS: Calling 911 for fun is not a joke. One of us can get hurt, and like Nick was saying, someone really needs us, and we have a delayed response to that person who only has six minutes to save their brain, it makes a big difference. Especially if you live in town, it could be your relatives, your parents, I don’t know, siblings. MG: The scariest things I’ve seen is on the ambulance, when you’re coming, people will do weird stuff to get out of your way thinking like, ‘We’ll go into the intersection and stop.’ So, just for a false alarm people can do some stuff that can cause accidents between themselves, even if they don’t hit us. V: Is the number of alarms at Paly unusual for the high schools around here? NP: Gunn’s hardly ever goes off. JS: So Paly has been under construction for a long time, that goes way back to since I started. So we used to get a bunch of false alarms from construction, and your typical pulls. But between Paly and Gunn? Yeah, Paly’s got it beat, by a long shot.